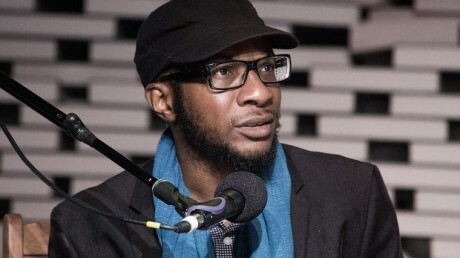 This year’s Raymo Lecture guest speaker is the Nigerian-American writer and photographer, Teju Cole, whose acclaimed book Blind Spot has been hailed as “an elegy for the lost arts of looking and seeing,” by The Village Voice. Intrigued by that blind spot, Cole blends visual and narrative art, using his camera to capture ordinary everyday life and text to reflect on space and location from cities all across the world as well as cultural biases and skewered perceptions about gender, race, class, and faith. In his address at the Raymo Lecture, Cole will discuss themes from Blind Spot, focusing on the relationship between text and image, and exploring the ways in which we are all prone to debilitating forms of blindness. The Raymo Lecture will be held on Tuesday, October 3, 2017 at 6 p.m. in the Martin Institute Auditorium. All are welcome. Read Cole’s New Yorker essay, Black Body: Rereading James Baldwin’s 'Stranger in the Village'"
Read Cole’s New York Times Magazine piece, "Shadows in São Paulo"
Teju Cole was born in the U.S. in 1975 to Nigerian parents, raised in Nigeria, and currently lives in Brooklyn. His latest book is Blind Spot: a gorgeous collection of full-color photos, each accompanied by short selections of lyrical prose that explore “the mysteries of the ordinary” (The New York Times Book Review). His third book, Known and Strange Things—which was named to Time’s Top 10 Nonfiction Books of 2016, Kirkus Reviews’ “Best Nonfiction of 2016” list, and one of Harper’s Bazaar’s “13 Best Books of 2016”—is a collection of essays that span art, literature, and politics, with topics from Virginia Woolf and James Baldwin to President Obama and Boko Haram. The Chet Raymo Literary Series was established in 2001. The annual event brings significant writers of poetry, fiction or non-fiction to Stonehill to share their work and to speak about the art of writing. Past speakers have included Junot Díaz, best-selling author and NPR contributor Sarah Vowell, then-U.S. Poet Laureate Robert Pinsky, Jennifer Egan, and poet Claudia Rankine, Irish poet Seamus Heaney. The Raymo Lecture Series is named in honor of one of the College’s most celebrated faculty members, Professor Emeritus of Physics and Astronomy Chet Raymo who has written 18 books on science and nature, including four novels, one of which was made into a major film, Frankie Starlight.